The New Brunswick Southern Railway is getting another passenger car. "Table car" #508 was in Moncton, New Brunswick on Saturday evening, having arrived on CN 474 from Joffre Quebec where it has been since September 26. #508 was originally built by the Canadian Car and Foundry company for CN as a coach. It was rebuilt into a 60-seat table car and was owned by the New York Susquehanna and Western. One end has a little snack bar area and it looks like it would be perfect for serving snacks on a little excursion. I found this listing showing the car was listed for $33,300 and was sold. Judging by the photo of the shiny car, it seems to have weathered quite a bit before being sold again by Ozark Mountain Railcar to NB Southern. This album (by Ozark Mountain Railcar, apparently) has some very detailed photos of #508. Here are a few samples. Thanks to Ron Pelletier, JP Veilleux and Mike R for the sightings, and to Steve Hunter for the detailed information on #508. The Northlander made its last run on Friday, September 28. The Ontario Northland Transport Commission terminated the train, ending 110 years of history. I won't get into the politics of the decision, given that I am not very familiar with them. Instead I will share a few photos and video that railfans took of this event. The last Northlander had engines 1809 and 1800 leading power car 202, coaches 604, 615, 612, 606, 600 and 702 through Bracebridge, Ontario and apparently dropped a couple of coaches before arriving at Union Station in Toronto. There were articles by the CBC and The Star covering the event. Stephen Gardiner posted a few photos on Flickr. Here are some videos on YouTube. First, from TEHTRAKS111. Next, this long video from RPS19 of the train in Bracebridge. Here is the northbound #697 in Thornhill, the last northbound train. EDIT: Corrected caption for the last video. I was out with my son and we spotted a CN crew working the Fort Garry industrial area. This is by the former Manitoba Sugar plant. GP9 CN 7044 and GMD1 CN 1405 were shuttling some cars around on and off the main line, under the tender care of the CN crew with their remote control devices. While we were waiting and I was photographing, a deer came running into the field by the tracks, intent on crossing over. Unfortunately, the train was in the way. After a minute or so, the deer ran under the train car. Fortunately the train had stopped for a minute and the deer made it safely. Don't ever do this. Trains can move at any time in any direction. Here's one of my favourite engine types, a GMD1. I had always wanted to photograph the elevator in Grenfell, Saskatchewan, and last month I was able to do so. I arranged to stop there on our way to Regina and I spent about 10 minutes photographing the rail area. The elevator is quite a handsome structure, with fresh paint and it is obviously well maintained. At one point there was a Saskatchewan Pool elevator in Grenfell, but it has been replaced by a concrete Viterrra structure outside town. Here's another view of the Viterra structure, taken from the highway a few days later. 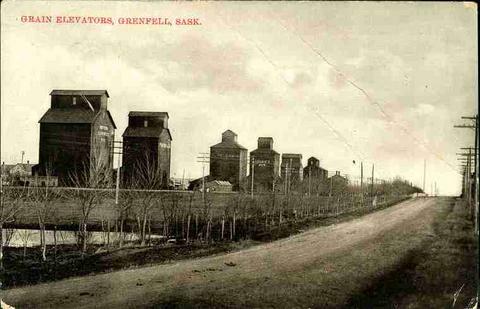 Check out this cool postcard I found at the Saskatchewan Archival Information Network site, showing at least six elevators in Grenfell. Oh, when I was in Grenfell I saw two CP SD40-2 engines idling away, coupled up to a spreader. I guess they were part of a work train but there was noone in sight. There's a new initiative called the National Dream Renewed aimed at promoting passenger rail in Canada, and rolling back the recent VIA Rail cuts. It is a joint project of the national Transport Action Canada and its regional rail groups. They are touring the country holding town hall meetings to bring the message to the people. Next week they are in Atlantic Canada (starting in Halifax on Monday) and if you are in the area, get out and show your support! Please pre-register on their site first so they will know how many people will be attending. They had a town hall meeting in Sudbury, Ontario last week that was well attended. Transport Action (formerly Transport 2000) does good work in all aspects of public transit but especially in rail. I have been a member for many years and I support their work. Why not join them? I was driving on the Perimeter Highway over the CN Letellier subdivision in Winnipeg when I spied CN 533 coming home. It was really the most remarkable coincidence, as there is only a short stretch of track visible to the south, and there was the head end of 533 rolling along, with two engines including a grey one leading! This engine is former Grand Trunk and Western (GTW) 5948, an SD40-3 now owned by Alstom and lettered GCFX 5948. It was apparently originally built for the Kansas City Southern railway. The above shot was through the windshield, and I rolled my window down to take the "going away" photo below. You can see where the large white "CN" on the side has been painted over. On my return from my errand, I noticed that there was a CN freight train parked just west of Diamond outside Winnipeg. The train had IC 2703 on the point and was apparently waiting for a westbound freight before heading into Winnipeg. I set up my video camera to point at 2703 for the meet... and then they rolled ahead a few hundred feet! Maybe they were shy. In good time the westbound train arrived. It was led by a Dash-9. The crew of 2703 were on the ground to inspect the train. Not bad for Yet Another Meet! Oh yes, after 2703 started rolling, I headed out to get another shot of it. First, a pacing shot. They were not going especially fast yet. I decided to nab them on the other side of Diamond and call it a day. Here's that shot. You can see they were crossing over to the south track here. The Dominion of Canada has arrived in Halifax, on CN 120 as mentioned earlier. The above shot by David Tindall through the fence at the Ceres terminal shows the two steam engines parked, waiting for the Atlantic Conveyor to come pick them up next Tuesday September 25 to begin their journey across the Atlantic. Matt aka Saintjohnrailfan caught the Dominion of Canada on CN 120 en route. They are headed over to celebrate the 75th anniversary of the Mallard's world steam engine speed record. Here is a nice web site listing all of the festivities. Thanks to David Tindall, David Othen, Bob Liming and Matt for information, photos and video. Some of you may know I'm a bit obsessed with grain elevators as well as trains. Heck, I have a whole grain elevator photo gallery for them. Here are a few I've seen this month. This is the Viterra elevator at Pense, Saskatchewan, on the Canadian Pacific main line. This one is not new to me. I took this shortly after sunrise. Later that morning, I shot this grand complex in Moose Jaw, Saskatchewan. This Viterra elevator apparently handles mustard seed, and is served by CN off the Central Butte subdivision. The elevator dominates this area of Moose Jaw by its height, rivaled only by the Parrish-Heimbecker elevator on the other side of the Canadian Pacific yard. Just a bit west of Moose Jaw is this grain elevator, another Viterra property. It is basically right on the Canadian Pacific main line. Lest you think there are only Viterra elevators in Saskatchewan, here is the Cargill elevator just outside Moose Jaw. Sorry for the blurry shot, it was a long distance photo. Switching provinces, here are two views of a grain elevator complex in Maidstone, Ontario near Windsor. Until fairly recently this was served by CN off the Caso subdivision. As I mentioned before, the Caso subdivision is now idle and the trains don't come here no more. You can see the rails are still in the ground here. The Dominion of Canada, a British-built A4 steam engine, has almost completed its journey from the Canadian Railway Museum in Delson, Quebec to the docks in Halifax, Nova Scotia for its trip to England. You may remember that its sister, the Dwight D. Eisenhower, traveled to Halifax in mid August. The two are going to join their A4 sisters for the 75th anniversary of the world record performance of fellow A4 engine Mallard. September 13: Montreal, QC. Left CN's Taschereau yard for Joffre, Quebec. September 14: Joffre, QC. Arrived late afternoon. September 15: Joffre, QC. Departed on CN 308 around 8 AM. September 16: Moncton, NB. Shunted onto CN 120 outgoing track. September 17: Arrival in Halifax, NS on CN 120? Moveright has a new Flickr photo set for the Dominion of Canada move. Check it out, they are really good. The photos in this post are from that set. I visited the Winnipeg Railway Museum today during the two-day free Railway Days event, and found out about some upcoming events. Back on August 25 I was driving around Winnipeg with my kids. We drove up Waverley and as I crossed the CN Rivers subdivision, I saw a train parked just west of the crossing. I parked nearby and took a shot of it. CN 2571 and an ex-BNSF C40-8 were parked on the north track. There was a crew in it but they were not visible in this shot. The reason for their parking there became apparent when another CN train came around Portage Junction toward them, also on the north track! Lest you think they collided, there are crossover switches located just east of Waverley Street that allow trains to change tracks. You can see one of the crossovers in the photo above, and the other one is closer to the street. CN 2555 West crossed over and passed the standing CN train using the south track. I noticed a sticker on the nose of CN 2555, advertising the EcoConnexions program. In true Canadian fashion, the sticker on the engineer's side was in English and the sticker on the conductor's side was in French. Back in May, CN announced the launch of the EcoConnexions From The Ground Up program. CN is supporting the "greening" of communities through its partners Tree Canada and Communities in Bloom. Full program details are here. Apparently CN announced the 25 communities selected this past Friday. CN had intended to distribute $150,000 but upped it to a cool half-million based on the "overwhelming" response. You can see the list at the bottom of the press release. Sorry, New Brunswick, we know CN has two lines going through your province but you got nuttin' - why beautify the north shore when CN might not run through there soon? Nova Scotia received one award for Elmsdale. Anyway, once I shot the meet, I jumped in the car and headed down Taylor Avenue to try to get ahead of them. I easily got to Shaftesbury Boulevard before them and shot CN 2555 coming out of the morning sun. Good on CN for investing in local communities. I headed west on Wilkes and got ahead of it before it reached Diamond. I set up the video camera and then took this pan shot as they came by. Note the weird clean panel on the ex BC Rail unit. After that I headed out on the Perimeter. As I approached the crossing where the CP La Riviere subdivision cuts across the highway, I saw a long grain train heading south. I crossed and then headed down highway 330 a bit. I pulled across the track and waited for the train to roll along. It was doing a fair speed, with big engines CP 9662 and CP 8777 doing the work. Here's the train heading south down toward La Salle and beyond. It's nice to see big power on the La Riviere subdivision. Usually all I see are the GP38 / slug pairs of CP 3028/1128 or 3027/1127.